e-mails have been sent and each have 48 hours to respond! I've been a vitamin consumer for years now and have introduced my children to them. Even my oldest is now taking prenatal vitamins and surprisingly, my husband takes them too. I also worry about the quality of vitamins given everything that has been in the news on the efficacy of vitamins and the brands. When Hero Nutrionals contacted me to see if I was interested in reviewing their Slice of Life and Gummy Bear Vitamins, I reviewed their site and found several things I liked it. Hero Nutritionals was established in 1995 so they have established a history of reliable products. They are also the first company to put vitamins into a gummy delivery system and are all natural. The founder and CEO, Jennifer Hodges, consulted with children's nutritionists, food chemists and production experts to create this innovative approach to encourage children to take their vitamins without having to pester and remind them to take them. Slice of Life was born from requests from moms and dads wanting a gummy type vitamin themselves. Many people, like my father, have a hard time swallowing pills so this is a great way to ensure anyone can get their vitamins. They are available at many stores to include online stores. Just click here to see where you can find Hero Nutritionals. Hero Nutrionals supports various charitable organizations such as World Vision, Special Olympics, Autism Speaks and many more. Offer other products for good health here. 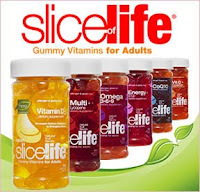 Slice of Life are delicious tasting and are actually better than gummy bears in my opinion. There are many to choose from and they are gluten and allergan free. That is a bonus for many who suffer from issues surrounding glutin laden products. I was able to review the Multi-Vitamin + Lycopene and Vitamin C + Pomegranate as noted below. Multi-Vitamin + Lycopene - Full Spectrum of Daily Vitamins and Nutrients for Adults - the vitamin was just right in flavor and gummy consistency. I liked that it was as tacky as normal gummy products are and it was delicious tasting. I expected it to have an unpleasant taste but I was wrong. I like the fact that lycopene is added to the multi-vitamin given the research conducted with the benefits of lycopene. Vitamin C + Pomegranate - Vitamin C with Popular Pomegranate Antioxidant - I just wrote a post on pomegranates so I understand the importance of what pomegranates can provide relative to our healths. I was happy to see both versions and as is the case with the multi-vitamin with lycopene, it tasted good and the gummy consistency was just right. I like the idea that I can take a vitamin without it leaving a bad after taste. If you need help with deciding which vitamins are best for you, Hero Nutritionals can help. 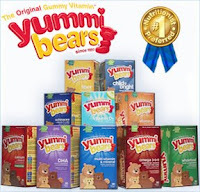 Yummi Bears are the #1 Nutritionist Preferred gummy vitamin for supplemental value in nutrition and has won numerous awards with "Kids Critic Choice" for the best tasting gummy vitamins for kids. The gummy vitamins are easy to chew, allergen free, gluten free, all natural flavors and all natural colors. They also come in many choices and for this review, I gave my two girls the Multi-Vitamin and Minerals. Multi-Vitamin and Minerals - Full Spectrum of Daily Vitamins & Minerals for Children. My six year old was apprehensive as she's not a gummy bear fan. She is very sensitive to tastes and smells so getting her to take this wasn't as hard as I thought. Even my two year old was ready to take the taste test. It didn't hurt that the cute little gummy bears have what looks like a sugar coating that tempts them even more! They both seemed to like it and have continued to take them daily. As in the case of any medication or vitamins, it's important to put these out of the reach of children as I could easily see them wanting to help themselves to more. Given the test, the history of Hero Nutritionals, the formulas behind the vitamins and the fact they offer such a variety to include organic vitamins, I definitely recommend them for both adults and children. They were a hit all around between myself, my husband and my two kids. 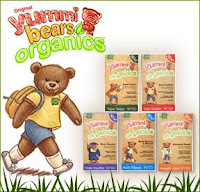 Two winners will win their choice of two bottles of either Gummy Bears or Gummy Bears Organics. Follow my blog and leave a comment after going to Hero Nutritionals on what vitamin you would like to try. Sign up for Hero Nutrionals newsletter here. Giveaway ends 3/2 at midnight. Random.org will be used to pick the two winners. *Disclaimer. Hero Nutritionals provided three bottles of vitamins in exchange for my honest review. No other compensation was provided and my family and I are still taking our vitamins.